I am really excited to be able to speak again in Manchester this October. This time I will be speaking about the ways and tools you can use to assess your code quality and its design. While software metrics help a lot and tell a lot about code, you have to remember they only should be treated as a guidance, not the goal in itself. So be careful and don’t start coding only to make the metrics look pretty. Here is an excellent video from Alberto Savoia for these who’s gone a bit too far with software metrics. I have received a lot of positive feedback after my The Journey towards Continuous Integration talk at PHP NW 2010 conference. It seems that a lot of people have found it both interesting and inspiring. I am really glad. After the talk many people asked me about Sonar which I briefly mentioned and were eager to know more about it. With this blog post I will try to fill the gap in my talk. I have heard about Sonar for the first time about a year ago I think. It looked cool! All the fancy graphs, statistics, numbers… But, first I couldn’t understand how would it actually fit into our development process and secondly it had no support for PHP. A lot of things has changed since then though. With a continuous integration process nearly in place at work, we now need to properly track the progress not only of the build itself, but also how in overall our code quality changes. We want to know whether the code complies to the rules we have set up, whether over time it gets better and at the same time we want to communicate the progress to the business. What a surprise for me it was, when I have found out that actually all of that we could achieve with Sonar! And imagine the grin on my face when I was told that there are people that have started working on PHP plugin for Sonar! Installing Sonar is very easy. 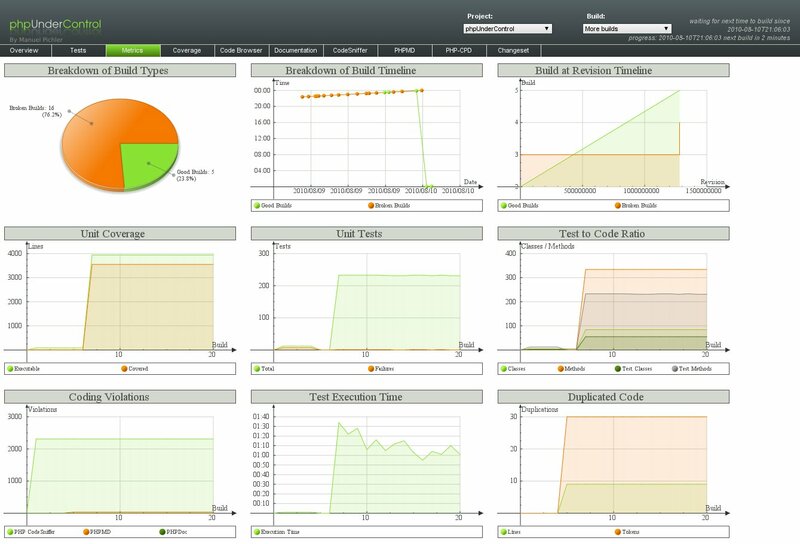 Sonar runs on any operating system that support Java and Maven. For version 2.1 which I am gonna install you will need Java Development Kit v1.5 or later and Maven 2.0.9+, 2.1.+ or 2.2.+. If you’re using Ubuntu distribution, just can just follow the instructions below. With all the things in place it’s time to download Sonar. You can get it from its download page. Remember that not all plugins are compatible with all Sonar versions, so before you make a decision which version to download check Sonar Compatibility matrix. Because I am gonna use 0.2 version of PHP plugin I will download Sonar 2.1.2. By default Sonar runs with an embedded Apache Derby database. If you want just to play with Sonar or test it then you can just skip the next step, but if you plan to use it later on or you want to install it in a production environment then you better switch to more robust database server like MySQL, Oracle, Postgresql or MS SqlServer. Sonar suports them all. I will install it and configure it with MySQL server. The server should automatically be started after that and should accept any incoming connections. Now we have to create empty database and a user that Sonar will use. Let’s name the database and user sonar and use S0n4rU53r as a password. Obviously it’s up to you how you will call them, just make sure you use the same names later on in Sonar configuration file. Also remember this is only a sample configuration and you might want to configure the access to database differently for security reasons. #> mysql -uroot -p -e "CREATE DATABASE sonar"
#> mysql -uroot -p -e "CREATE USER 'sonar'@'%' IDENTIFIED BY 'S0n4rU53r'"
#> mysql -uroot -p -e "GRANT ALL ON sonar. * TO 'sonar'@'%'"
Next, edit conf/sonar.properties configuration file, uncomment template for MySQL support and comment out the default Derby configuration. At the bottom of that file, in Global database settings section, you can change default database username and password. Now we’re ready to start Sonar for the first time. Start and stop scripts are located in bin directory. It gets a while to start it for the first time as the database schema is being set up. Have a look at the log file to see the progress and watch for any issues that might prevent Sonar from starting. Just browse now to http://localhost:9000/. Sonar is ready to use. At the moment (mid Nov 2010), only version 0.2 of the plugin has been released, and you can download it from the official plugin site. If you are already using them, you will know how to install/configure them. Only PHP_Codesniffer requires special treatment, so I strongly recommend you follow my installation guide for PHP_Codesniffer below. For those of you, who are not really familiar with these tools yet, here is a quick guide how to set them all up. Now lets use PEAR installer to install PHPUnit. This is a standard installation procedure for PHPUnit. 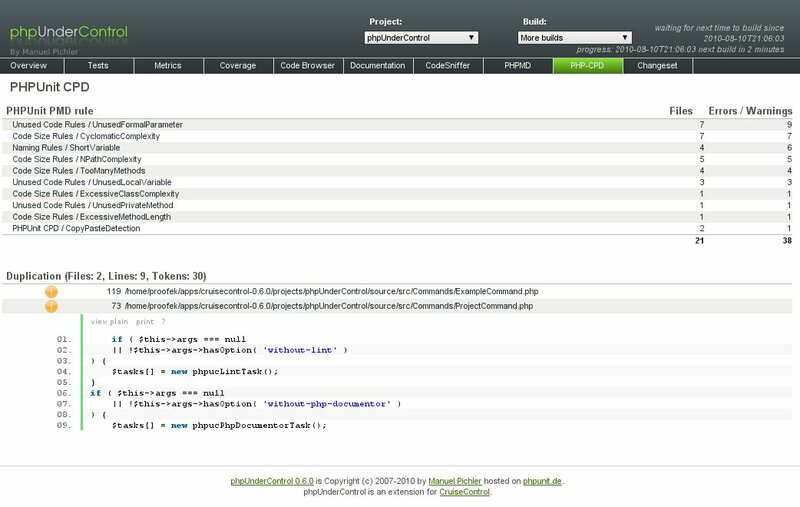 PHPUnit 3.5.3 by Sebastian Bergmann. and pecl installer to install Xdebug. We will need php sources and some development tools as well, because pecl will actually compile Xdebug on the fly before installing it. For systems from Ubuntu/Debian family just use apt to install php5-dev package. Refer to Xdebug documentation for specific configuration options. Let’s just verify now that PHP has Xdebug support. With PHP_Codesniffer it’s a little bit different. The stable version 1.2.2 which is available now (mid Nov 2010) doesn’t support rulesets yet (but bear in mind version 1.3 will). So guys at SQLi have come up with a work around. Then we have to download and install SQLi Codesniffer which will work like a bridge between Sonar and PHP_Codesniffer. If for any reasons these links or instructions doesn’t work anymore, check the original instructions at SQLi site. If you carefully watch logs now you will see the plugins being loaded and set up! We’re just about to analyse our first project then. How exciting! There is only a few things left before we can start though. All you have to do, is to replace underscored values with relevant ones. I’ll show you a complete example of it in a minute. Refer to your operating system documentation to find out how maven is installed by default. In Ubuntu/Debian family system global configuration file is in /etc/maven2/settings.xml, while in MacOsX it is in /usr/share/maven/conf/settings.xml. If there are any profiles activated already there, just simply delete them. They don’t exists anyway and will only cause maven to complain during analysis. The last thing we have to do is to switch on a few options and make some tweaks for the PHP plugin itself. 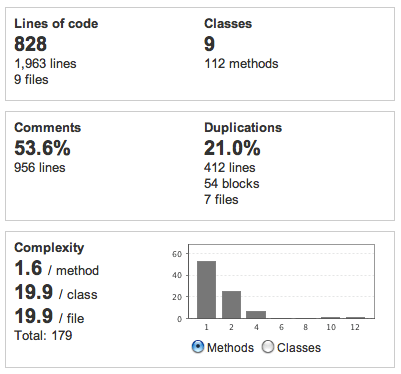 Integration with the PHP tools is pretty basic at the moment, but is enough to perform some simple analysis. So I am gonna run Sonar in so called dynamic analysis mode, run the tools manually to create all xml reports, and then run Sonar maven task to parse them and add the results to Sonar dashboard. The only exception will be PHP_CodeSniffer – I will let Sonar run the SQLi version and produce compatible report. Bear in mind in future plugin releases I expect the integration to get much better and then, if you would like to you will be able to use Sonar to run the tools. I have picked up vfsStream project as an example for analysis. Unfortunately this is the only open source project I have found so far, that requires a minimal effort to get it up and running. I have tried PHPUnit, pdepend, PHP_CodeSniffer, Zend Framework and many many more, but they either fail analysis, they are not compatible with PHPUnit 5.3 yet or they have very custom test suite runners which would need some major changes before we could actually perform analysis. From my experience so far, Sonar often can not analyse the project because it still has problems parsing coverage report. I expect this to improve in next plugin versions though. Most problems can be solved by stopping using AllTests.php files and properly defining phpunit.xml file with filter whitelist section. I have analysed dosens of projects at work using that approach without a problem. Writing code coverage data to XML file, this may take a moment. vfsStream doesn’t have phpunit.xml file, but fortunately AllTests.php works just fine. Now let’s run PHP Depend to create pdepend report. Generating pdepend log files, this may take a moment. [INFO] Searching repository for plugin with prefix: 'sonar'. [INFO]  PHPCodeSniffer ended with returned code '1'. Let’s get back to the browser now and refresh the dashboard. Congratulations! 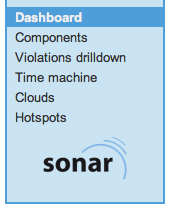 You have just analysed your first PHP project with Sonar! I will only briefly tell you about different sections of the dashboard this time. Feel free to explore it and remember – there is quite comprehensive documentation at http://www.sonarsource.org/ including wiki, tutorials and even some screencasts! 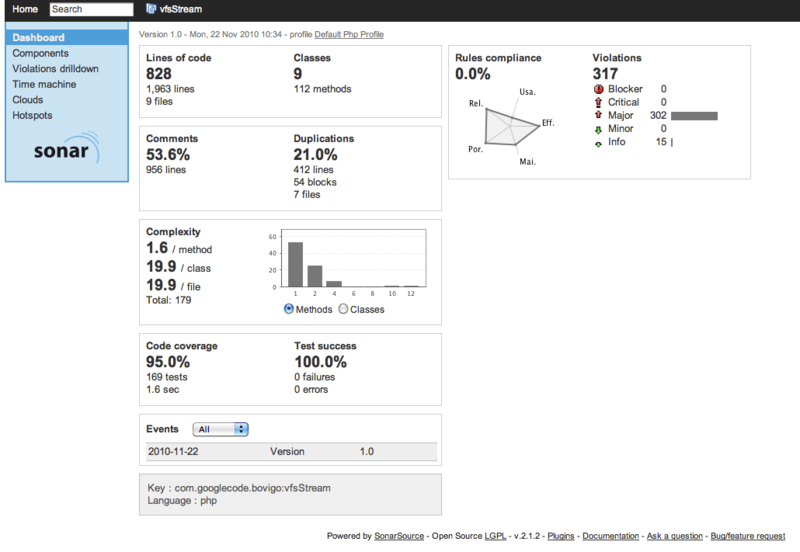 At the top of the dashboard you have all the results of static code analysis, including all sort of statistics about your code complexity and size. 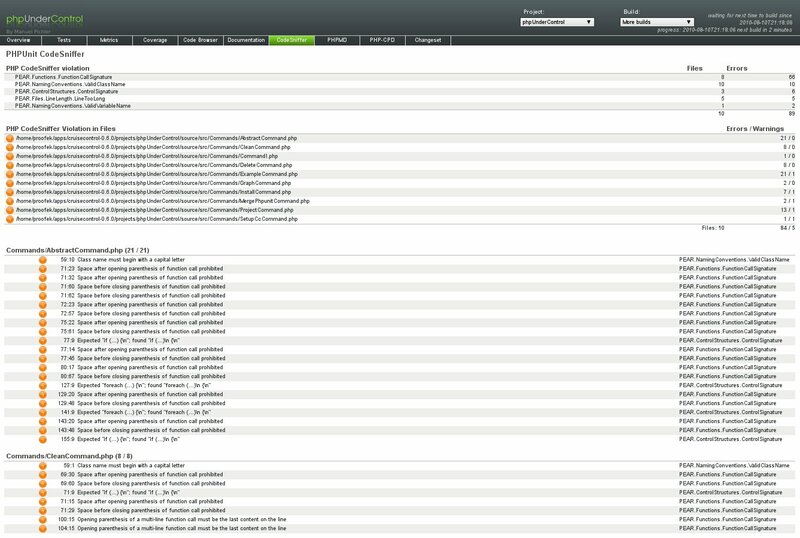 On the right side of the dashboard, Sonar reports all rules violations generated by PHP_CodeSniffer. Don’t be surprised with the results you see. Remember we didn’t configure the plugin to use any specific standard. 0.2 version of the plugin uses an included GN standard, just for illustration purposes. That will definitely improve in future plugin versions and complete integration with PHP_CodeSniffer 1.3. Integration with phpUnderControl is really trivial. All you have to do is to add another task to your ant build file and execute it at the end of the build! It will only get better! Happy analysis! I am pleased to announce that new version of phpUnderControl is out. Release 0.6.0 brings a few new features as well as a few bug fixes. Big thanks to hpbuniat for this contribution. Changeset tab contains details of modifications in the source code since the last successful build. Copy/Paste Detector tab contains report produced by Copy/Paste Detector (CPD) for PHP. Integrating CPD with phpUnderControl is dead easy. Just install the tool and define another target in your build file. See an example below. phpcpd 1.3.1 by Sebastian Bergmann. PHP Mess Detector and Codesniffer tabs got refreshed a little bit and now contain a bit more details. Implemented #665: Display limit for build metrics. As per Manuel post earlier on, now it is also possible to control maximum number of log entries displayed on the graphs. Simply modify your config file that generates graphs and add –max-number option to it. Fixed #771: Invalid character in CodeSniffer output. Fixed #732: Show revision of SVN/CVS on dashboard. Patch supplied by hpbuniat, through phpunit’s issue tracker. Fixed #1003: Force build button in the /cruisecontrol app doesn’t work. Fixed #1044: callServer should return false. Patch supplied by Mekras in phpunit’s issue tracker. The newest version of phpUnderControl has now basic support for PHP_Depend. With PHPUnit deprecating support for metrics, it’s just about the time to switch. And it’s not as complicated as it might sound. Finally just add new ant task in the build file that will run pdepend and generate metrics xml file and additional graphs. Now either wait until next build happens or simply trigger the next build manually and navigate to the metrics tab. All the charts should be still there. In addition two additional charts has been added – Package Dependencies and visual summary of the analyzed project source code. Package dependencies chart is also shown at the top of phpUnderControl Overview tab. We are a Star Club!